Air Science® provides complete support for ducted and ductless fume cupboards, laminar flow cabinets and safety cabinets in compliance with HSG258 under COSHH. Minimise equipment failures and ensure the safety of operators by servicing your fume filtration equipment on a regular basis. Failure to do so could result in harmful vapors being recirculated into the air. 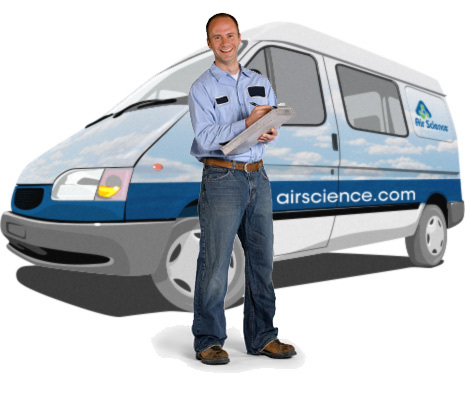 For customers desiring turnkey filter service and management of their ductless technology equipment, Air Science offers the Filter Service and Maintenance program. An Air Science filter expert analyzes your ductless technology application and generates a specification for equipment, filtration, installation, and inspection. The specification is suitable for use with requests for quotations from equipment manufacturers and installers. When the equipment is installed, one of our experts will certify the installation as compliant to the specifications and provide your operations and safety personnel a detailed certificate of the materials and processes for which the equipment was designed and properly installed and ongoing inspection and maintenance requirements to assure continuing performance and protection. As part of our normal maintenance and fume cupboard service protocol, our personnel will consult you on each step of the process to become COSHH compliant as determined by HSG258. This consultation is free of charge and is included in the annual maintenance and service agreement fees. Read more about COSHH and HSG258 compliance by visiting the Health Safety Executive website. At the specified intervals, we will contact your operations and/or safety personnel to assure conformance to the application and maintenance requirements for the equipment. If there are changes to your application or usage, we will implement any required changes to your certificate. We will walk you through filter saturation tests and replacement procedures as required. Our program ensures safe operation year round by sending you Annual Filter Change Reminders and offering filters to fit a wide range of manufacturers. We guarantee the lowest prices on filters and will take an additional 10% off any competitor’s quote that is lower. To inquire about our Filter Service and Maintenance program, please call 077 54 977572 or email Air Science Technologies, Ltd. Select our Live Chat option to talk directly to one of our representatives.